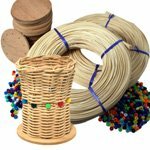 Weave 20 baskets with this CAMP KIT. Includes twenty 4" pre-drilled bases, beads, one easy-to-follow pattern & enough #3 round reed to weave 20 baskets. (Same pattern as our Kids Kit) Our easy to understand instructions and very detailed pattern make this is an easy to teach and easy to learn basket kit. Camps, Schools and Vacation Bible Schools use this kit with great success year after year! V.I. Reed & Cane, Inc. is in its 35th year and 2nd generation as a veteran-owned family business. We are proud to sell our own high quality, Made in the USA basket and seat weaving kits as well as a wide range of other supplies.